civil rights and anti-Vietnam War movements, Kuhn and her cohorts created an activist organization that quickly gained momentum as the Gray Panthers. After receiving national publicity for her efforts—she even appeared on the Tonight Show with Johnny Carson—she gained thousands of supporters, young and old. Their cause expanded to include universal health care, nursing home reform, affordable and accessible housing, defense of Social Security, and elimination of nuclear weapons.Gray Panthers traces the roots of Maggie Kuhn's social justice agenda to her years as a YWCA and Presbyterian Church staff member. It tells the nearly forty-year story of the intergenerational grassroots movement that Kuhn founded and its scores of local groups. During the 1980s, more than one hundred chapters were tackling local and national issues. By the 1990s the ranks of older members were thinning and most young members had departed, many to pursue careers in public service. 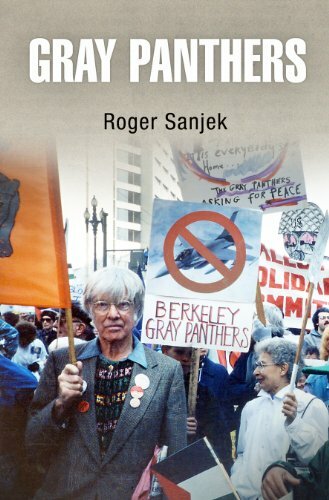 But despite its challenges, including Kuhn's death in 1995, the movement continues today.Roger Sanjek examines Gray Panther activism over four decades. Here the inner workings and dynamics of the movement emerge: the development of network leadership, local projects and tactics, conflict with the national office, and the intergenerational political ties that made the group unique among contemporary activist groups. Part ethnography, part history, part memoir, Gray Panthers draws on archives and interviews as well as the author's thirty years of personal involvement. With the impending retirement of the baby boomers, Sanjek's book will surely inform the debates and discussions to follow: on retirement, health care, and many other aspects of aging in a society that has long valued youth above all.